Tracheostomy is an unpleasant, but effective means for transitioning patients off ventilatory support after prolonged periods of respiratory failure following cardiac surgery. There is, however, a perceived risk of patients getting infections of the surgical, sternal wound if tracheostomy is performed too early. This perceived risk means patients are often delayed in tracheostomy, including the benefits of ability to speak, reduced mortality, reduced ICU stay, and reduced delirium until the surgical wound is felt no longer at risk. This study employed a retrospective analysis of over 5,500 patients seen for cardiac surgery at Johns Hopkins Hospital between 2002 and 2008. Logistic regression controlled for common co-morbidities to determine if tracheostomy was associated with sternal wound infections of various degrees (superficial, deep, and mediastinitis). After controlling for co-morbidities, tracheostomy was not associated with increased risk of sternal wound infections. Monsen CB, Allen JG, Arnaoutakis GJ, Baumgartner WA, & Conte JV. 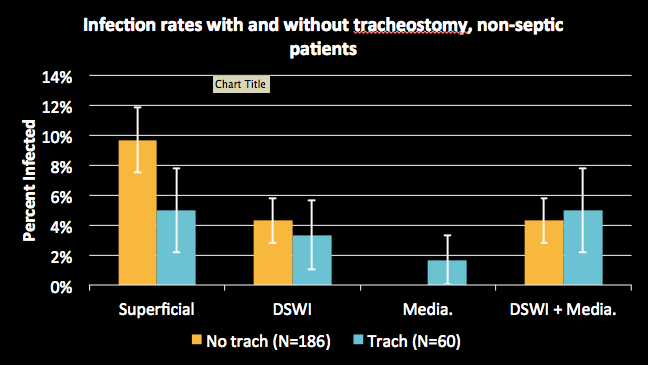 The effect of post-operative tracheostomy on the incidence of sternal wound infections. JHU MSRD. Batimore, MD, 2011.